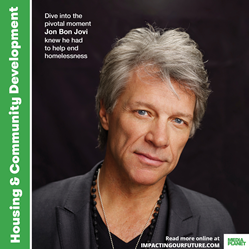 Mediaplanet’s Housing & Community Development Campaign brings awareness to the nationwide affordable housing crisis and talks to Jon Bon Jovi about his contributions combating it. The aim of this campaign is to garner support and heighten awareness to the affordable housing crisis affecting millions of people nationwide, highlight feasible solutions to making housing more affordable and push policy makers and leadership groups to take ownership. Publishing on Single Parent’s Awareness Day, Mediaplanet launches this special edition “Housing & Community Development” campaign. The aim of this campaign is to garner support and heighten awareness to the affordable housing crisis affecting millions of people nationwide, highlight feasible solutions to making housing more affordable and push policy makers and leadership groups to take ownership. The affordable housing crisis has reached a critical point. According to the Pew Research Center analysis of Census Bureau housing data, 40 percent of households are rent-burdened, putting more than 30 percent of their income towards housing costs. The issue grows as demand for housing options disproportionately increase more rapidly than available housing. With so many Americans in need, it’s hard to determine one viable solution. Jon Bon Jovi and the Soul Foundation address the growing issue of homelessness as a result of the affordable housing crisis. This campaign dives into other results of and solutions to this crisis surrounding families, seniors, solar solutions, mental illness, financial instability and lack of awareness. This campaign was made possible by the support of Habitat for Humanity, Department of Housing and Urban Development, National Law Center on Homelessness and Poverty, National Association of Affordable Housing Lenders, National Real Estate Investors Association, National Association on Mental Illness, NAHRO, New York State Association for Affordable Housing, AARP and Solar Energy Industries Association. Additionally, a special thank you to our key partners Conifer LLC, CGI Federal, Wholesale Solar, Caring.com, USA Properties Fund, and Greenlight Financial.